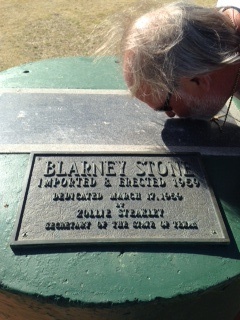 Before leaving Shamrock we felt compelled to kiss the Blarney Stone in order to give ourselves the gift of gab and good fortune. I must admit I kissed it too. 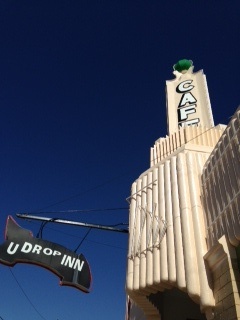 Then we scurried back to the U-Drop Inn and Tower Cafe which is now a museum with Route 66 memorabilia. Kissing the Blarney Stone had us gabbing away with Doris who worked at the museum. Doris loved traveling with her husband. She was quick to point out that they traveled in a car, not on a motorcycle. Prior to his death 10 years ago, they covered west of Texas all the way to the Pacific but she never got a chance to travel east. We offered her a ride on our scooters but she said she had to work but took a rain check. She was quite a card. At the conclusion of our visit she wished us safe travels and invited us back anytime. Just follow the arrow to find Doris inside working at the museum. Drop in and say hello. She’d love the company. 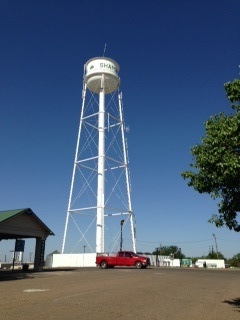 Did you know the Shamrock Water Tower is the tallest water tower in Texas. Right across the street from the U-Drop Inn is the Shamrock Water Tower. It was build in 1915 for $6,560 and is approximately 172-176 feet tall. 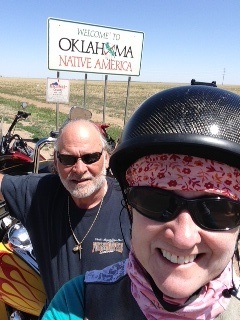 After having too much fun in this Texas Irish town we headed out on 83 to Perryton. The road to Perryton was busy with oilfield service traffic. It’s safe to say the economy is booming. Since Perryton is on Texas/Oklahoma border we had to do a quick fly-by. We turned around and realized it was true. It’s day five and we’re still in Texas. We u-turned at the border and headed back to Perryton. There we stopped in at the Museum of the Plains. That was a half an hour stop that could have lasted all day. Believe me when I say this, but this place is a hidden gem. It is home to over 10,000 artifacts. The main building is dedicated to early settler lifestyles. There is a Natural History room with fossils and an impressive arrowhead collection. I found this little guy in this room. They also have a Great Hall where they display covered wagons, steam engines, tractors, cars and more. The place is huge but you wouldn’t know it from the street. I’m sorry we didn’t have a chance to visit each room so looks like we’ll be going back sometime. It is located at 1200 N. Main/Hwy 83 in Perryton so if you ever get up that way pop in for a visit. We called it a day in Amarillo. 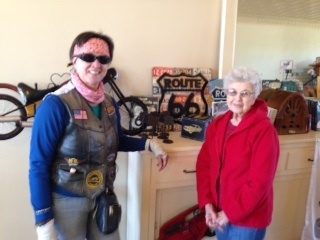 This entry was posted in On The Road Again, Uncategorized and tagged motorcycle travel, motorcycle trip, museum of the plains, panhandle, perryton, route 66 texas, Shamrock, Texas Panhandle. Bookmark the permalink. Loving the blog!! 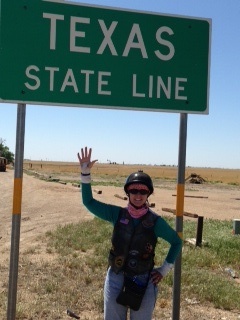 I’ve been all over east Texas but not too much north and west. By the way, Saratoga is the birthplace of George Jones! Hey Barbara, I had fun on the ride. Looks like I’m going to plan doing it again. What I found most interesting was that everything you want to see as far as scenery and terrain is right here in Texas. Shoot, I may never leave again. I picked up a new follower today on my blog from India. She is a college student who loves to ride. She has a blog too. You might like to read about her travels as well. varsharammohan047.wordpress.com Her article is title Solo Ride. You could probably Google her if your interested.